Amara did it again! She made The Principal’s Honor Roll for the first trimester of second grade. For those of you who may have just joined us, she made the honor roll all year while she was in first grade. She gets her report card today when Mommy and Daddy go to her parents/teacher conference but yesterday she brought this home from school. Jenna found it in Amara’s class folder when she was going through it. This is probably one of the reasons Amara continues to do so well in school. Every day when she gets home Jenna goes through her folder and looks at her homework for the evening and all the class papers for the day and they talk about them. Jenna checks all of Amara’s homework and drills her on her spelling words every evening. She is really involved in Amara’s education. She is also really involved in Amara’s classroom and I think all of this makes a huge difference in how Amara looks at studying. Justin is a great Dad, too. Every night before Amara goes to sleep (with the exception of a few times when she was younger and would lose a story or two) he reads 2 stories to her! Jenna and Justin both love to read and have surrounded Amara with books which has made her love to read. Amara’s room is filled with books, so is her room here. Justin has always spent quality time with Amara when he gets home from work. He helps her with her arts and crafts and he is also her go to person for anything science related. They are awesome parents and I am very proud of them! I have been busy working since Amara started second grade so I have only gotten a couple of chances this year to drop her off or pick her up from school but I’ve heard all about it. I always make a point of asking her how school has been and I get all the details about who got moved to what table and why! Sometimes I even get seating diagrams! She really likes her new teacher and she if obviously doing well. Amara is also awesome and I am very proud of her, too. 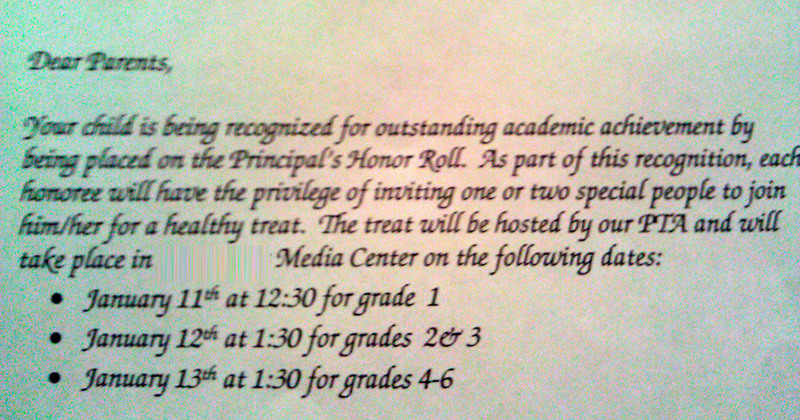 This memory was posted in Special Occasions and tagged Amara, honor roll, school on December 14, 2011 by Grandma Kc. Yaay!!! We’re all very proud of her. Good for Amara. Good for Mom and Dad who stay very involved. As a teacher, I will confirm the positive difference it makes. Grandparents play an important part too. Blessed all around, huh? Amara has been fortunate to have some pretty awesome teachers but I sure wish she could have you for fourth grade. I love reading your blog and hearing about all of the wonderful things you do with your students. Good students need good teachers. I’m sure her good grades and enjoyment of school has much to do with her grandma too! Congratulations, Amara! Yes indeed, involved parents make all the difference in the world. I saw proof of that with all the kiddos in the literacy program I oversaw. Those whose parents read to them each night as recommended saw improvement and success; those who didn’t had kids who struggled and remained in the program semester after semester. And you are a wonderful great aunt! I will have to tell everyone about the special stationary you made for her this Christmas! You are the best.